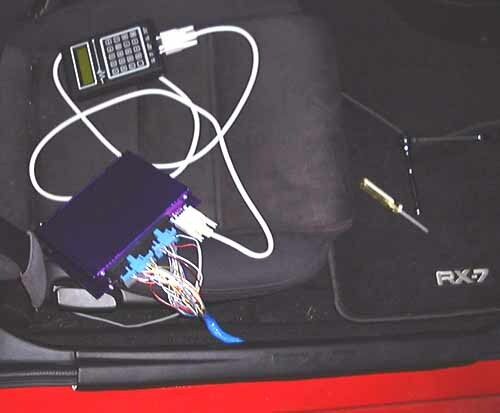 Installing a fuel computer such as EFI System's Programmable Management System (PMS, also known as the PFS Powertrain Management Computer or PMC) is easy. The HKS FCON installs the same way as the PMS but has an additional connection to sense boost. If you have a boost gauge simply T off the line and run the boost line to the FCON's boost sensor. Start by disconnecting the negative (black) terminal on the battery, then remove the passenger kick-panel. It has two buttons securing it, just pop up the center of the button with a knife or small screwdriver then pull the buttons out and remove the kick-panel. The plastic door sill just pulls off straight up. The ECU is held in place by a bracket with 3 10mm bolts, just loosen the top bolt (leave it in place) and remove the two bottom bolts, then slide it out. 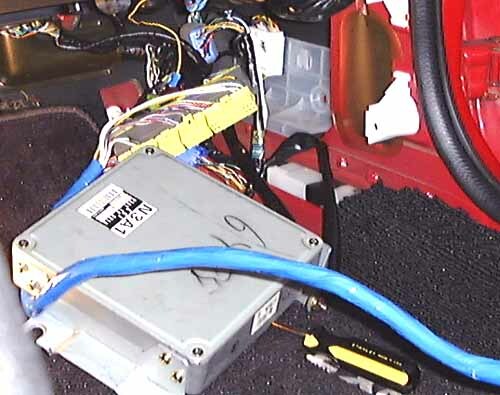 Use a small flat blade screwdriver to depress the plastic latches on the ECU's harness connectors and pry the connectors out one at a time (there are four connectors in a line connected to the ECU, remove them all). Connect the fuel computer's harness to the stock harness, make sure the latches snap into place. 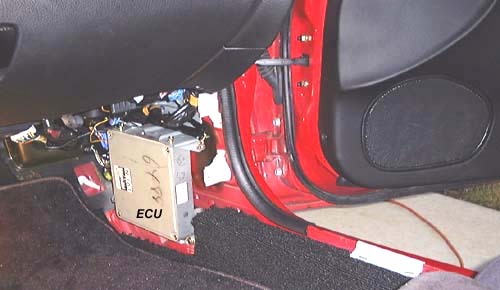 Then plug the fuel computer's harness into the ECU. Put the ECU back in place and secure the 3 bolts. Unclip the white plastic clips that secure the rug along the door sill. Run the fuel computer's harness as shown below to where you want to mount your computer. I put Velcro patches on the bottom of my computer and simply slid it under the seat (above the carpet). Others have removed the passenger seat (5 bolts) and mounted it just in front of the seat under the carpet, or under the seat and carpet. If you put it under the carpet remove the carpet pad to make it fit better and don't forget to write down the info on the sticker on your computer, you'll need it to determine what firmware version you have for support or upgrades. Connect the serial cable to the computer. Even if you don't have the keypad or acquisition software go ahead and install a serial cable just for future use. 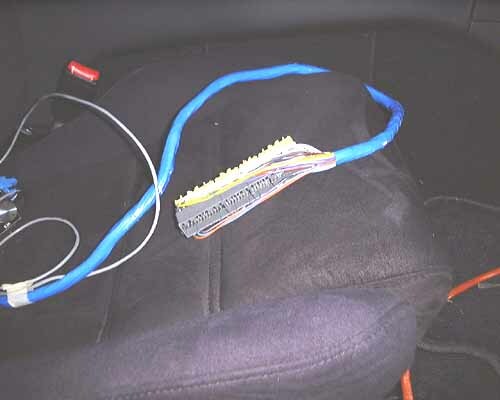 Push the computer harness under the seat from the side, then pull the harness out the front of the seat and plug in the connectors. Position the computer into its final resting place. 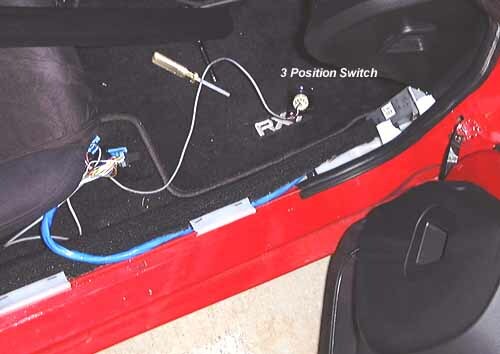 Put the 3 position switch wherever you want, I temporarily just ran it up into the passenger side storage bin. Later I replaced the rotary switch with a small 3 position toggle switch, see the PMC Switch How To. That's it, it's installed. Be very careful when programming your PMS. If you lean out the mixture too much you might blow an apex seal requiring a complete engine removal and rebuild. Be sure to get your boost under control first by lowering the manual vent settings before you start to adjust the fuel settings. My PMS was having trouble limiting high RPM boost so I followed Wael's suggestion and set my manual vent settings to 4C primary boost and 27 secondary and turned vent learn on. This solved my boost creep problems. I don't know if everyone is aware of this, but EFI systems has a news group dedicated to the PMS. Doug monitors the posts and responds to them. Most of you who got their pms/pmc's this year should be aware of this, but i thought I'd post it in case anyone wasn't aware of it. To join the list go to http://www.onelist.com and sign up as a member. You need to search for the newsgroup and can do that by searching for "efi pms". I've been perusing the daily archives for several days going back and think it's pretty interesting.